NZCCSS welcomes people from around the globe who are be visiting Aotearoa New Zealand and reading Policy Watch for the first time. We wish you a happy, peaceful visit, and hope that, in some small way, Policy Watch can help us all to create a better world. The future of aged care in New Zealand is one where we all have a part. So NZCCSS is calling for sponsors and papers to its 2012 Services for Older People conference ‘Moving Forward Together’. This will be held at Te Raukura –Te Wharewaka o Poneke on the beautiful Wellington waterfront on 29-30 March 2012.
mealimitedbusiness@gmail.com (021) 029 24328 NZCCSS contact Jo Paku jo.paku@nzccss.org.nz 04 4732627. Housing New Zealand is changing its approach to housing provision. The organisation has been reviewing its work, together with Government. HNZ will now focus on “two core areas”: (1) provision of state houses to high needs tenants and maximising the “return on the Crown’s investment in social housing”, and (2) “management of state houses tenancies for those most in need for the duration of their need”. The refined goals mean less reliance on walk in offices and more reliance on a call centre and automated functions, co-locating neighbourhood units with MSD Community Link Centres, mobile tenancy managers, and no longer delivering social services. Employee numbers will be reduced. Simon Collins outlines concerns about Housing New Zealand’s policy changes. He quotes John McCarthy, from the Methodist Mission's Lifewise agency: " … we are going to see more people in Housing NZ poorly supported, which will put more tenancies at risk, result in more evictions and more people coming out of Housing NZ accommodation and potentially more homelessness more." Labour’s Moana Mackey is askingHousing Minister Heatley to‘…end … the speculation about major restructuring at Housing New Zealand which is extremely destabilising for communities and causing major distress for staff and tenants alike.’ She highlights a young mother with a four month old baby in Gisborne who turning to a real estate agency for assistance more. Thanks to poverty, many potential All Blacks will never get the opportunity to develop their skills. Poverty has been described as the principal source of stress, and stress causes a raft of negative outcomes. We get increased infant mortality, mental retardation, drug addiction, alcohol abuse, violence, ethnic tensions, child abuse, despair and hopelessness. We want to prove our rugby team is the best in the world, but are denying many of our children (and therefore our country) the possibility of being future All Blacks. We need the talent pool. We’re just not that interested in fostering it. Public Health Association Executive member Eileen Brown has underlined the point. 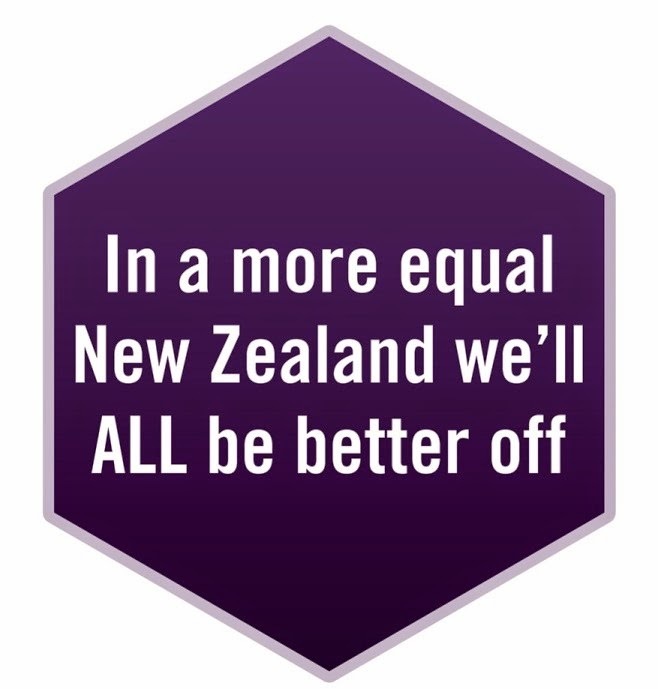 “High incidence of obesity, mental health problems and teen pregnancies, high rates of incarceration, infectious diseases and childhood deprivation – none of these will go away or improve, if there is no action on New Zealanders’ very unequal incomes”, according to Eileen. She suggests all government policy must be assessed by an ‘income inequality framework’ to know the likely effect of policy on the income gap. Meantime the Child Poverty Action Group is at the High Court regarding the Working for Families tax package. CPAG claims the ‘off the benefit’ requirement of the $60 per week In-Work Tax Credit breaches the right to be free from employment status discrimination and is unfair. The Human Rights Review Tribunal “held that the IWTC was discriminatory” in 2008. It also held that it “disadvantages children in beneficiary families who miss out ‘in a real and substantive way’ but that the discrimination was justified in a free and democratic society.” CPAG is appealing the finding the discrimination is justified. Te Ara Hou is Every Child Count’s report on getting it right for Māori and Pasifika children. And it does focus on getting it right. The report is powerful because it asks what it means to have a good human life, and then provides a Māori approach for what this means. The power lies in its ability to provide hope. There are also plenty of responses. Māori and Pasifika populations comprise a growing proportion of our children. If Māori and Pasifika children lose out, we all lose out and suffer the economic and social consequences (Hone Kaa, Every child Counts). There are nearly 200,000 children living in poverty and over half of them are Māori or Pasifika. Many political parties and other groups have something to say on this one. Tariana Turia describes the report findings as “the end result of a history in which our people have suffered the chronic loss of land, of language, of resources; and are now they are stripped bare – robbed of the very essence of who they are.” Labour, the Greens, and ACT have all reiterated their policies regarding children. It might be also our best chance of winning a future World Cup. This was launched on 5 September and applies both in Australia and New Zealand. The aim of this Strategy is to further: promote early intervention and prevention, increase responsiveness to victims and reports of child abuse, build consistency in the investigation of child abuse, establish and enhance standards and principles of best practice, support and promote a whole-of-community approach, and develop appropriate responses to indigenous communities and culturally and linguistically diverse and emerging communities. Police are encouraging people to report any abuse without delay more. 2. How permanent is the job increase? Numbers on unemployment benefits fell by 1,145 last month, and new job advertisements have increased. However, is this a sustainable change or is it just a large number of people doing short term jobs courtesy of the Rugby World Cup? Christchurch’s Social Issues Papers– Discussion papers produced by Christchurch Methodist Mission on social issues to be addressed in the rebuild of Christchurch including Child Poverty, Gambling, Housing Affordability, Alcohol Misuse, Employment, Food scarcity, Age friendly cities. Find papers here. More coming soon. Te Ara Hou, Every Child Count’s report on getting it right for Māori and Pasifika children. Grandparents Raising Grandchildren National Conference at the Ellerslie Events Centre in Auckland, on Wednesday and Thursday 16th and 17th of November 2011. Gratitude Café: join the spirit of gratefulness at Te Waipuna Puawai, 12a Umere Cres, Ellerslie, Friday 23rd September 2011. You’re welcome anytime between 10am - 1pm to share good company, food, fun and celebrate what we are grateful for. Contact puamiria@twp.org.nz. Free Child Abuse Prevention workshops run by Child Matters and Child Youth and Family. These are aimed at teachers, social workers and health professionals on knowing what to look for and how to respond to signs of abuse more. “Working for the common good means looking beyond what is just good for me, to what it is good for the wider society. It is about ensuring ‘everyone has a chance to grow and develop equally."